These are many of the recipes I want to cook for my family!!! Cathy, great job!! Thanks for including my recipes!!! I really like your book. Thanks for adding my Banana Square Recipe. Thank you for your recipes...and Thank you!! Cathy, How Sweet of you to add (2) of my recipes for Your Grandaughters Recipe Book. I hope they cherish what grandma has made for them. Thank You Lillian, it is my plan to cook all the recipes i chose for the cookbook, and thank you for sharing your recipes and looking forward to seeing more from you!! 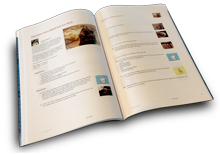 Thank you so much for adding my 2 recipes into your cookbook! I hope you'll try them one day! You have a wonderful collection!